GHost’s Sarah Sparkes has contributed a ‘final word’ on GHosts to Garageland 21st edition ‘URBAN GHOSTS’. Sparkes’ article included an excerpt from her chapter on ghosts in as well as an excerpt from a ghost story collected during her recent Arts Council funded residency in Liverpool. 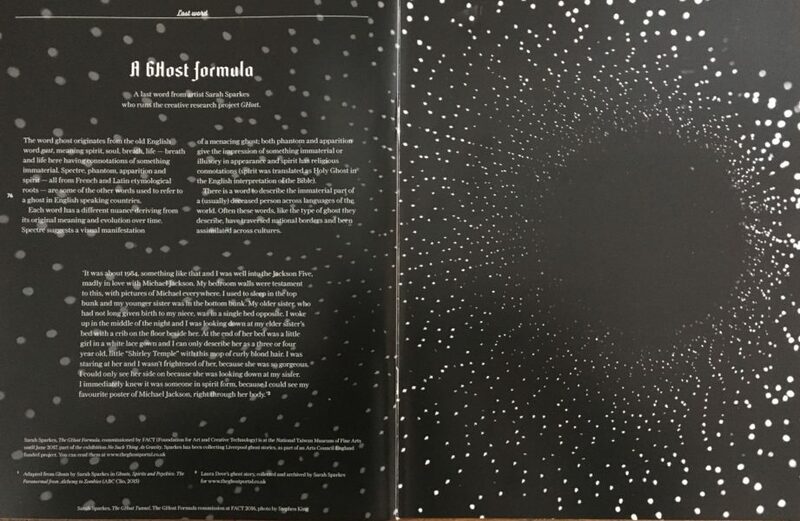 The image was taken from Sparkes recent FACT commission ‘The GHost Formula’, part of the exhibition ‘No Such Thing as Gravity’ curated by Rob La Frenais. Garageland is the magazine of Transition Gallery and is edited by Cathy Lomax.